Philip II of Spain inherited the Kingdoms of Spain, Naples, and the Netherlands from his father Charles V. As a prince, he was briefly married to Mary I of England, and has ever since been regarded as a villain to English Protestants. He was an ardent Catholic, and reigned over a far flung realm during a very difficult period in history. Although he is a favorite target of Calvinist calumny, his personal morals were not particularly bad, by European monarchial standards, and he was a meticulous and careful, although often ineffective statesman. He was however, highly intolerant of heresies and his harsh measures to surpress Calvinist rebellions in his territories undoubtedly alienated a large portion of his Netherland subjects. The Dutch rebellion and the Spanish Armada are the two conflicts Philip II is most well known for, but they were only a few of the ongoing conflicts during his reign. At the time Philip came to the throne, the Ottoman Empire was stepping up its attacks in the Mediterranean, and posed a threat not only of piracy, but of invasion. Philip formed, a multi-national Christian navy, in order to oppose them, but it suffered a disastrous defeat at the battle of Djerba. Eventually however, the Philip's navies were victorious, and the naval Battle of Lepanto, led by Philip II's half-brother, Don John of Austria, essentially destroyed the Ottoman threat in the Mediterranean. War with France was also nearly constant problem for Spain. The last major campaign of the Italian Wars, occurred between 1551 and 1559. After defeating the French in Italy, Spain opened up a front in the Rhine region, and quarted Spainish soldiers on territories of the Netherlands. After the war was over, the Dutch states wanted the solders removed, but instead they were taxed to support a standing foreign army on their own territory. This was one of the original causes of the Dutch rebellion, the other being the spread of Calvinist heresies. 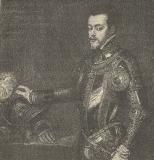 Philip II favored a very severe policy and sent Alva to put down the Rebellion. His iron-fisted antics only alientated the population, and caused the Northern Dutch to openly declare their independence. The great hero Don John of Austria later become Governor, but even his more accomodating style failed to heal the divisions. At last Philip appointed Alexander Farnese, and although he governed well and brought the southern states back into the fold, even he was unable to regain control of the Northern states. At the same time, Spain's relationship with England had deteriorated considerably, due to many factors—piracy and the war in the Netherlands among them. Philip meticulously planned for a Spanish Armada to invade England but it failed miserablely. On the domestic front, Philip is often blamed for mismanaging Spain's government so that, in spite of the enormous riches pouring into the country from the American colonies and from Portugal's trading posts in the far East, Spain remained a poor country. There is some truth to this, but many of the problems Philip had to deal with were fairly intractable, and power was shared between the monarchy and the nobles in a manner that made powerful, centralized decision-making very difficult. The enormous, unearned wealth flowing into the country was largely consumed by a frivolous aristocracy and a collection of intrenched, regional, bureaucracies rather than used for the public good, but Philip did not have strong monarchial powers to prevent this. 1527 Born to Charles V, Holy Roman Emperor, and Isabella of Portugal. Raised in Spain. 1543 Married princess Maria of Portugal. She died two years later, after giving birth to Don Carlos. 1554 Married Queen Mary of England. She died two years later without issue. 1556 Succeeded to the thrones Spain and the Netherlands, at the abdication of his father, Charles V.
1556 Resided in Netherlands for first 3 years of reign. 1559 Moved court permanently to Spain. 1560 Philip organized a navy to attack Ottoman pirates, but they were defeated at Djereba. 1565 Christian Victory at the Siege of Malta. 1567 Sent Alva to govern the Netherlands and put down Protestant rebels. 1571 Sends large fleets to victory over the Ottoman Turks at the Battle of Lepanto. 1573 Dutch fleet defeats the Spanish at Zunderzee. 1574 Turks recapture Tunis from Hapburg allies. 1578 Death of Don John of Austria; Alexander Farnese appointed Governor of Netherlands. 1580 Throne of Portugal descends to the Spanish Habsburg crown. 1585 Peace Treaty between Hapbsburgs and Ottoman Turks. 1588 Spanish Armada is destroyed off the coast of England. 1590 Intervened on the side of the Catholic League in the French Religious Wars. 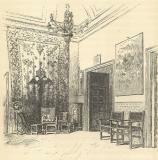 1598 Died of Cancer at El Escroiral. Charles V. and the Tory Prince. Charles V 16th century Hapsburg Emperor who ruled Austria, the Netherlands, Spain and parts of Italy. Duke of Alva Tyrannical Governor of the Spanish Netherlands who opposed Protestants during the Dutch Revolt. Don John of Austria Illegitimate son of Charles V. Hero of the naval Battle of Lepanto. Briefly governed Spanish Netherlands. Alexander Farnese Nephew of Philip III, who governed the Netherlands in the later years of the Dutch revolt. Margaret of Parma Half-sister of Philip II of Spain who governed the Netherlands in the early years of the Dutch revolt. William the Silent Hero of the Dutch Revolt. Led resistance to the Inquisition and Spanish tyranny.